Photos shown may be an artist rendering, model home or of the same model. From the Estate Collection, The Southill “ A” floor plan features a gourmet kitchen w/island, gas cooktop, stainless steel appliances & quartz countertops! Wood laminate flooring throughout the main floor! 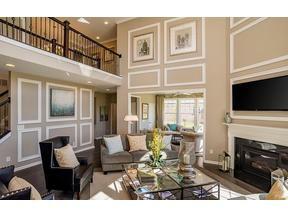 Custom features include decorative trim, mstr & dining rm tray ceilings, gas fireplace w/quartzite stone, & back hallway. Sun room, upstairs laundry, covered porch, fully sodded lot & full bath rough-in for finished basement bonus room w/egress are included!